Since my play is finished and the semester is nearing an end, I want to resume my series on movie/book connections. I’m choosing an old movie from my childhood because it was only a few years ago that I read the book that the movie was based upon, and it’s sequel. I’m in love with Pollyanna’s outlook on life even more since reading the books. The movie Pollyanna (1960) made by Disney, came out when I was a child. It takes place at the turn of the 20th century. I fell in love with Pollyanna and all the characters she encounters. In a way it was odd to watch Hayley Mill’s movies because lots of people told me that I looked like her. I didn’t believe them, but I liked being compared to her because I was a Disney fan. In those days Disney movies were mostly about family situations, lab experiments gone wrong, and cars with minds of their own. Many of them seem outdated now but not Pollyanna. In fact, I think we need more Pollyanna’s now more than ever. What I loved about the movie as a girl, was that even though Pollyanna’s parents had died, she carried on their teachings to find the good in every situation and to show kindness and respect to everyone she encountered. Those two principles, taught by my own parents, helped me through several moves, lots of challenging situations, and meeting lots of new people. Some might say this Disney movie is dated too, but I disagree. When Pollyanna arrives at her aunt’s hometown, it’s a pretty dismal place. Her aunt is cold and not happy about being saddled with her niece. She’s the richest woman in town but she’s unhappy and everyone is affected by her need to control everything. By contrast, Pollyanna is poor. She wears hand-me-down clothes because her father was a missionary. She has no outward reason to be joyful, but it’s what she learned. We never see her grieving for her parents. That may be one fault of the movie, but perhaps her determination to see the good in every situation is her way of coping with their deaths. And she spreads her joy, love and positive outlook on life wherever she goes transforming the town and eventually her aunt. I can’t remember what it was that made me pick up the first book a few years ago. It certainly wasn’t seeing the movie again. It’s rarely played anywhere any more. It may have popped up as a free book on one of my e-book apps. In any case, I was delighted to find that there are two books. I promptly read them both. As always some details of the movie script were changed from the book, but essentially the characters are the same. Pollyanna faces some tough challenges, like the accident that nearly takes the use of her legs, but she manages to face her fears and remain positive throughout the two books. In the end, she finds love and fulfillment by helping others change their outlook on life. And isn’t that what most of us would like, to leave a positive legacy? These past weeks I’ve found it hard at times to maintain a positive attitude. Maybe that’s why memories of Pollyanna flitted through my mind as I was trying to decide what movie/book connection to write about next. I don’t know why I, and so many people I know, fall into negative thought patterns. It’s not a happy place to live and a hard habit to break. But it can be done one little rainbow maker, one moment appreciating the beauty all around us, and one attempt to help someone else at a time. So many of the spiritual teachers I follow say that every minute of every day we get a chance to start over. That’s what Pollyanna says too. Find something to be glad about in every situation. 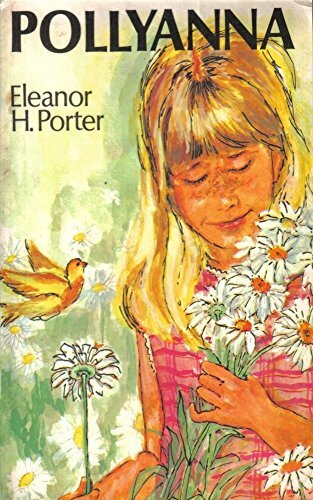 Thank you Eleanor H. Porter for writing such a lovable character who reminds us that we are in control of one major thing, how we perceive the world. And that makes all the difference. Thanks for reading, liking and commenting. Make today a happy one. It drives me crazy when people use the word Pollyanna in a derogatory way, like there’s something wrong with being a Pollyanna. We wish were all a little more like Pollyanna! My theory is that we get addicted to pain and suffering. And we think being kind, positive, and loving is being weak when it’s the other way around. Thanks for your comment. I’m glad you want to be like Pollyanna too.